I did it! I ventured into the world of Tinder. When it comes to dating, I’m pretty open to trying anything…meaning sites/apps. I was doing online dating when it was still taboo and you didn’t tell people. Now it’s the social norm to be on a site (or two). I’ve pretty much tried it all because you should keep your options open. Tinder, for those who don’t know, is the latest buzzed about app that simplifies the dating process down to a simple swipe. A lot of people said that it was the Grinder for straight people (i.e. just looking to hook up) so it made me stray away. However, a reader commented on my blog that they met the person they’re currently seeing on Tinder so I thought I should give it a try. Make sure your Facebook has all your best photos. The app connects to your Facebook account and you can’t add photos from any other place, so make sure your best ones are on your profile. Look at just more than their picture. It may be hard because there might not be a lot of information. But since the app connects your Facebook account, you can see if the person has liked similar things (i.e. tv shows, movies) as well as if you have any friends in common. You can only message if you’re a match. Feel free to swipe to the right (saying yes) on any guy you’d want to message you because you can only communicate if you’ve both said ‘yes’. Swipe at will! I felt like there were endless amounts of pictures to flip through so I didn’t feel too bad saying no to guys. You only find out if you’ve both said yes because then you’re matched up. Otherwise, feel free to be picky. Can’t find anyone? Try adjusting your GPS settings. You can select up to a couple hundred of miles so if you don’t live in a densely populated area like New York City, then you may want to expand your search. Overall, it felt like more of a gaming app where you quickly flip through pics. It was either Yes or No, no maybe or save for later options. Or no going back if you accidentally swiped the wrong way or what they describe on their FAQ as #YOSO (You Only Swipe Once). There wasn’t a lot of information provided about the person, as many didn’t fill out the About Me section. Being matched up (meaning they liked your picture too) doesn’t mean too much because only 4 out of the dozens of matches I made actually turned into conversations and all of those conversations fizzled out. I am not a big fan of these apps because they make guys so lazy. For example, HowAboutWe is a site that proposes date ideas from both parties. It is supposed to encourage taking the conversation offline quicker than with most typical sites. However, with my years of being on the site I’ve found that most guys just like your date idea and move on. In my opinion, Tinder doesn’t encourage a lot of conversing or actually meeting up. While I did see someone that I followed on Twitter, I wasn’t sure if I should call him out like “hey, just spotted @(username) on Tinder!” lol. What say you? 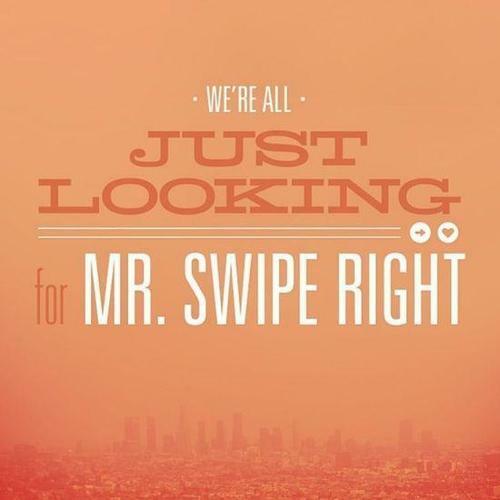 Would you venture to Tinder-land? Or if you’ve downloaded the app, what was your experience? Check out more from DATING GIRL & her date adventures in New York City.